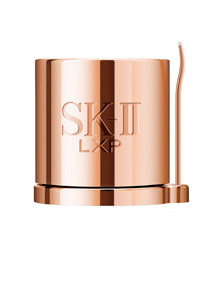 This indulgent super serum is perfectly blended with SK-II’s Highest Concentrated Pitera™ and Skin Regenerating ActiV™ penetrates the layers of your skin’s surface for transformation that starts from within•. Subtly fragranced with Rose Absolute, the most exquisite scent in the world, to comfort and lull your senses. Rich, velvety serum that is readily absorbed by your skin. Warm a few pumps of the serum in your palms and smooth over your face. Blend the serum into your skin by gently pressing with your palms. 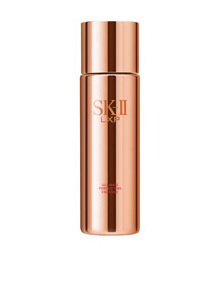 Apply every morning and night after a beauty essence, such as SK-II’s Ultimate Perfecting Essence. Water, Glycerin, Galactomyces Ferment Filtrate, Niacinamide, Butylene Glycol, Sucrose Polycottonseedate, Isopropyl Isostearate, Isohexadecane, Dimethicone, Cetyl Alcohol, Polyacrylamide, Panthenol, Polymethylsilsesquioxane, Tocopheryl Acetate, Stearyl Alcohol, C13-14 Isoparaffin, Benzyl Alcohol, Methylparaben, Dimethiconol, PEG-100 Stearate, Stearic Acid, Disodium EDTA, Laureth-7, Propylparaben, Cetearyl Alcohol, Cetearyl Glucoside, Ethylparaben, Fragrance, Sodium Hydroxide, Saccharomyces Cerevisiae Extract, Palmitoyl Dipeptide-7, Hexapeptide-3. Please fill out Confirm Password. The Password you entered does not match. Please try again. Please fill out Mobile Number. Please fill out Mobile Number - min 7. Please fill out Mobile Number - max 7. Trust is a cornerstone of our corporate mission, and the success of our business depends on it. P&G is committed to maintaining your trust by protecting the personal information we collect about you, our consumers. beauty and lifestyle tips by visiting SK-II website and counters. Generally one to three times per month. Earn loyalty rewards and exclusive offers with each purchase in our SK-II Membership club. And loyalty related information is available to check by visiting SK-II website and counters. promotions are available for your rewards tier. Your review title must be at least 8 characters long. Your product review must be at least 50 characters long. Please choose your star rating. Oops! You'll need to agree to our terms and conditions before we can share your review. What do you think this product is best for?